When we vacation, we love to get off the beaten path and talk with locals about what makes their town or country fabulous and unique. We will look for the quiet narrow alley, the corner that you cannot see around, and we will follow it, just to see where it goes or what is on the other side. 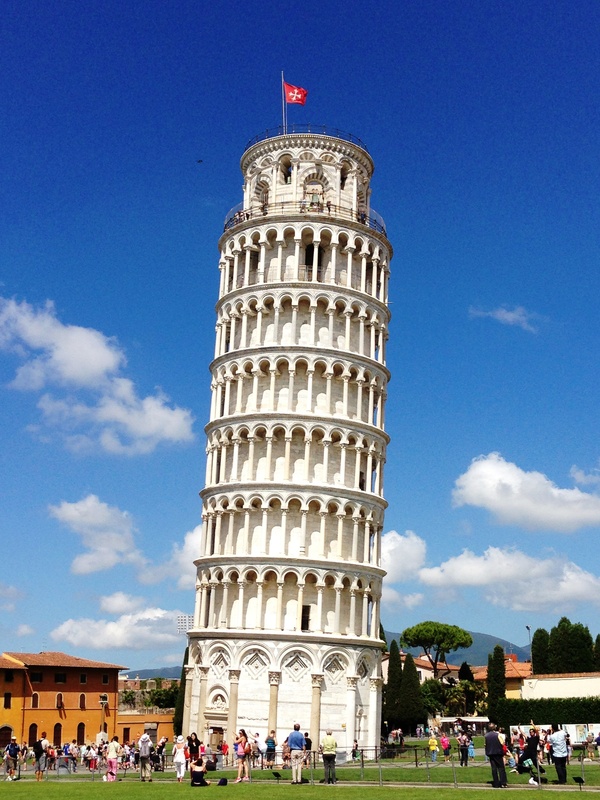 We did just that when we visited Pisa a few years ago. It was our first time to Pisa, so of course, we had to act like regular tourists, for a very short period. We had to get a few pictures of us with the Tower, the Baptistery, and Cathedral in the background. There were so many people we could not get a picture without hordes of people in the background! We did the best we could amidst the crowds by zooming in, changing angles and such. We managed to take pictures with some creative angles. We wandered the grounds around the Baptistery and Cathedral for a while. It was then that we noticed a deserted alley. We headed for this alley to escape the crowds of people and to see what else Pisa had to offer. At first, we just meandered the quiet streets away from the tourists. We were admiring the fabulous architecture display that was before our eyes. The detail and the amount of work put into the stonework, the arches, balconies and light fixtures left us in awe. We rounded a corner, and I nearly stumbled and tripped on the cobblestone street purely because I could not take my eyes off all the details in the buildings when we stumbled across a small market in the middle of the road. I say stumbled, but really, we walked right into the cluster merchants and their booths. What a sweet find! One merchant had made ‘steampunk’ jewelry from pieces of clock works. Another dealer was selling silk scarfs, lace doilies and such. Then there was the shopkeeper selling homemade soaps and lotions. Of course, there was the ever-present religious art featuring Mary, baby Jesus, a variety of saints and crosses. We even found Murano glass for half the price in the tourist areas! That was a score for us! We had looked at purchasing some Murano glass work in Venice, but alas, it was out of our price range if we wanted to continue our travels. At this market though, we were able to buy some small jewelry pieces to bring home, and we still had cash in the pocket for more treasures! On our way out of Pisa’s Miracles’ Square, we passed the line of merchants with booths filled with trinkets made in China, Taiwan or some other foreign place that was not Italy. Tourists lined the shops buying memorabilia to take home. As we passed, a smile spread on my face as I recalled the tiny market where we bought our memorabilia, straight from the artist, made in Pisa, Italy.